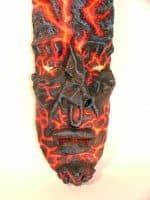 I recently finished two paper mache/plaster gauze projects that I wanted to share with you. 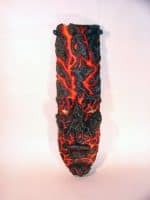 The first is another African inspired mask (I shared one with you last year I believe). [Yes, you did, Cory. You can see it here]. 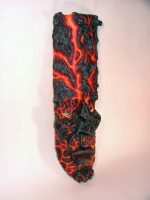 The lava rock was built our of chipboard and newspaper and covered with paper mache clay. Texture was added using crumpled tin foil. This mask is the second of nine masks that I am making to be displayed in a coffee shop. The second work is a friendly monster named Obi. 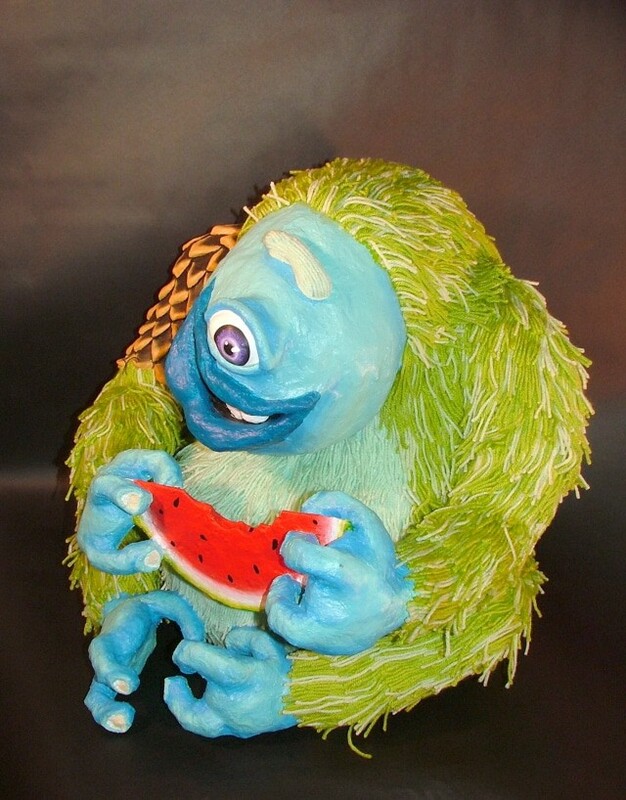 Obi stands about 2 feet tall and enjoys eating watermelon. Each hair was place individually which is the main reason why it took about a month and a half (working off an on) to complete. My students love having Obi in class and he has kind of become our classroom mascot. I’ll take this opportunity to throw in a bit of news of my own – I’ve been busy with tech support for weeks, now, because of some issues we had with the site, and almost all the issues have now been fixed. (Maybe I’ll be able to get back to work on something more fun, like paper mache!). I’m happy to announce that our image upload plugin is working again. I appreciate everyone’s patience. Now we need some holiday ideas. Anyone? I hope to make humpty dumpty, but not familiar with ‘plaster cloth’….bought a box of powder to make plaster of paris. What is the cloth or where do I get it? Thanks! Plaster cloth (plaster gauze) was once used by doctors to make casts when somebody broke their arm, but now it’s used in crafts. It’s a cheesecloth-type fabric that has been impregnated with plaster, so you dip it in water to activate the plaster, and then place it over the armature (or balloon, in this case). You can find plaster cloth in hobby stores, anyplace where they sell supplies for model train enthusiasts, and online. I’ve been using it a lot in the last year to speed up my paper mache projects, because it hardens so quickly, and adding just one or two layers of paper mache over it makes a very strong sculpture. Jonni (and other contributors to the site): I just wanted to thank you for your website and tell you that I appreciate your willingness to share your experience and wisdom with others. I recently was asked/volunteered to make some masks for a reception. The wall they were going to hang on necessitated building them bigger than life size and they needed to be light and cheap to make. I kind of knew I was going to need to make them out of paper mache, but the traditional flour and water paste method was going to take too long. 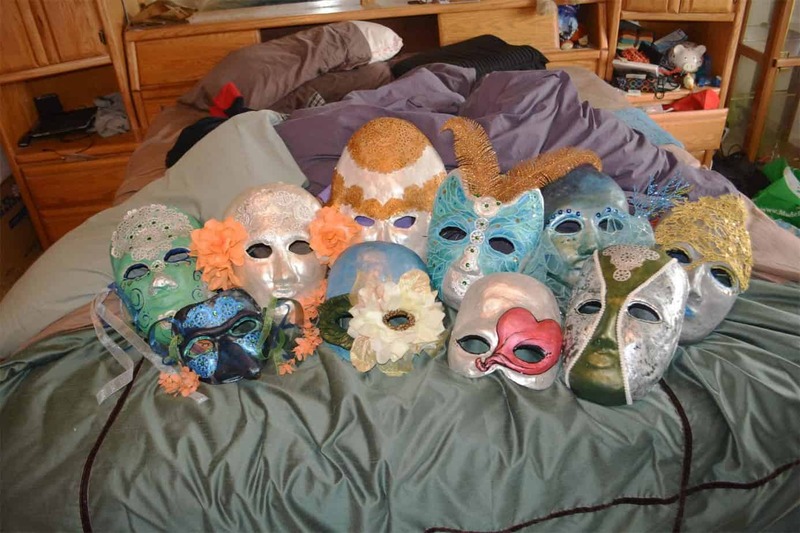 I had 12 days to make 10 masks. I used your method of Scotts shop towels with plaster of paris, glue and vinegar. It worked perfectly and was so fast. They came out beautiful. I don’t know how I would have gotten them done if I hadn’t come across your website. I think I’m now hooked on paper mache as I have a ton of other ideas of things to make. Thank you again. Thanks Christine! No real armature, just crumpled newspaper layered over and over. The fur was a pain, but it was worth it. I finished making Froggy on October 1st, so he hasn’t been exposed to our Mississippi sun for that long. Also, his location has a lot of shade. No cracking on him yet. I’m thinking about making him a Santa hat for the Holidays too. Obi is just to cute and I can see why your students have made him the class mascot. What kind of armature did you use? The detail on the fur is amazing. Jonni, here is a photo of “Froggy”. My first real project with paper mache. Froggy and the Snowman were a lot of fun to make. Froggy is an outside frog. I covered him with your paper mache clay and several coats of thin set. People that install ceramic tile use thin set to put down the tile. I mix it thin enough to paint it on with a brush. It helps to seal the clay. Also use a good paint and then I seal all with polyurathan so that I can put them outside. Seems to be working pretty good. He’s a real character. How long has he been outside? Have you had any problem with the polyurethane cracking in the sun? That frog is too cute. I do hope that it holds up outside. You should let us know from time to time. I love the Aw factor in that adorable frog. This photo may be too small, having trouble with sizing down my photo. It’s a perfect size. and what a cutie. Thanks for showing him to us. Holiday ideas..hmmm…well, I can only tell you what I’ve been working on (slowly). I’m almost ready to paint my piggy bank (he’ll be a present for my dad) and then there’s a tea set for my 2 year old granddaughter (her mom has already said that it will be to look at not play with) and her two older sisters have decided that they want a Crown of Thorns for the top of the Christmas Tree so that is the number one priority at the moment. It should be ready for painting tomorrow. I think a reindeer (maybe one named Rudolph?) would be a fun project. 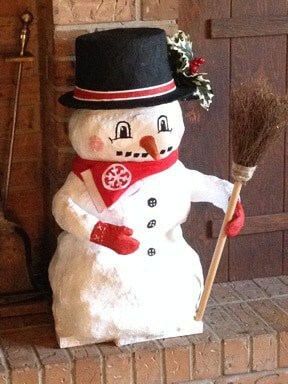 I am new to Paper Mache and LOVE your website. It is so very helpfull to me. You asked for new Holiday ideas. Here is one that I just finished for Christmas. Is was intended for outside but like him so well, he is still inside. 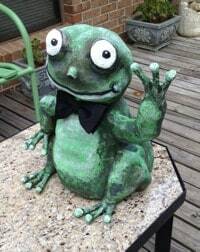 Earlier this year I also made “Froggy”. I can send photos of him later. Jackie, if you tried to upload a photo, please try again. I think the photo upload plugin in working again, but the images do need to be fairly small so the system will accept them. Thanks Jonni, I will try again. Cory, I just took a much closer look at Obi’s hair, and I can see why it took so long to complete that project! What dedication!